When making the switch to a more natural deodorant, you may experience heavier perspiration and even a fail day or two. Don't panic. If your body has been used to antiperspirants which, to a great degree, prevent perspiration, your body is now able to more freely release toxins and other buildups in the 'pit area. The longer you are antiperspirant free, the less perspiring you're likely to do as things balance out. That doesn't, however, mean you won't perspire at all. Perspiring is a natural process of the body. A fail day or two might also signify the balancing of body chemistry, not so much that the deodorant itself has failed. If you continue to experience a "musty" odor after about a week or two of use, it may be a signal that the deodorant blend is not working with your body chemistry and is instead creating an odoriferous (just wanted to use that word) breeding ground to alert you that switching up scents might be in order. Those who wear perfume or know of someone who does and the scent doesn't mesh well with their body chemistry, probably know what I'm talking about. Finding a scented or unscented balance that works with your chemistry is just as important as using a deodorant that isn't harmful to your health. 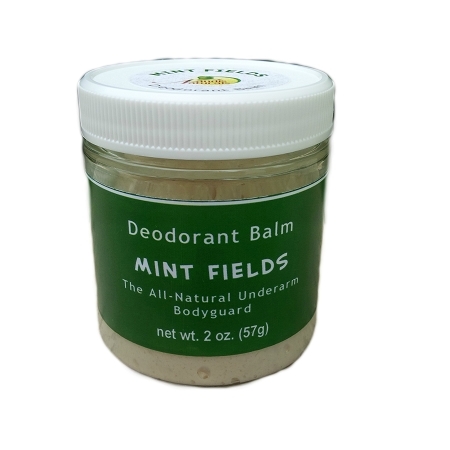 Our Mint Fields proprietary herbal blend, containing organic essential oils of peppermint, eucalyptus, lavender and patchouli, is a great first deodorant to try when purchasing from our lineup. It works especially well on those who perspire heavily or find themselves battling hard to find a scent that works in chemistry with their body. Need help deciding on the best deodorant to suit your needs? Send me a message or give me a call.